Exiland Backup Standard is a powerful yet easy-to-use software for backing up your important files. It lets you easily copy your important files automatically to various locations: network or local disks, remote FTP/SSH servers, NAS or other removable media (such as USB flash drives or external HDD). The program can also duplicate your backups to any places. It is perfectly suited for backing up the home or office files. Problems with long paths and unicode are solved. Exiland Backup does not block source files during backup operation . There is a free version of the program. – Backup to any locations: local/network drives, shared folders, removable disks, FTP, SSH servers, etc. I have been using an older version and am quite happy with it. A simple program that does what it says. As an example, I have a weekly backup scheduled of my “Documents” folder to an external drive. It works like a charm, creating the backup as a zipped file on the external drive. Pops up a little window at the start, clocks the process, then lets you know the end status, whether complete or if there was a problem. If no documents have been changed since the last backup, it tells you that and does not make a new one. If a scheduled job is missed for some reason, such as PC not being on, it tells you that when back on. It runs smoothly and is not a resource hog. My needs are fairly simple and I imagine much more can be done with this software that I am not utilizing. I have not had the opportunity or the need to get deeper into it. The GUI is simple and basic, not flashy at all, but don’t let that dissuade you, it works! Many thanks to Exiland and the SOS team. Our PCs contain a lot of useful and important data, and we keep creating more and more every day. But without taking necessary steps to save it, it could get lost forever, for different reasons like hardware failure, system failure, or data corruption by malicious applications. That’s why back up applications came into existence. They allow you to back up your data on regular basis and allow you to recover it easily, if something goes wrong. There are many software applications available to help you backup data, but not all of them work as they claim to. Exiland Backup is a lightweight and reliable application, designed to help you backup your personal and important files, so they can be recovered if a disaster strikes, and you lose your precious and important data. The installer size is ~5MB and the installation process is simple and straightforward, taking no time at all to complete. The version provided here comes pre-registered, and ready to use. Other versions can be activated using the license codes. Once done, you can start using the application, and create backups of files, folders, and directories easily. The UI of the application is clean and intuitive, with simple buttons and boxes. At the top is the menu bar, with usual drop-down menus, followed by a toolbar that contains buttons to important functions and features. The area under lists all the backup tasks you create, along with details like Name, Backup type, Source File/Folder, Save location, Schedule, Start time, and more. Selecting a task, its details are shows under the box. Backup task creation process is made easy by wizard guided steps. In the first step, you choose a name for the task, then you can choose the type of backup you want to create. After that you can choose source file/folder, adjust their parameters, and then tweak the compression settings. Lastly, you can choose where to save backup, choose a schedule, and choose notification settings for the task. – Simple and easy-to-use UI, designed to be suitable for all types of users, even the novices. – 4 different types of backups: Full Backup, Incremental Backup, Differential Backup, and Synchronization. – Backup files/folders from local, removable, external drives, local network, FTP, and SSH too. – Save backups to Local drives, removable devices, Network locations, NAS storages, FTP servers, and SSH (SFTP) servers. – Encrypt, compress, and split backup archives. – Post and pre backup tasks, with the ability to run third-party applications. – Notifications about backups by e-mail, SMS, or on-screen message. – Wizard guided task creation make the job easier. – Does not offer uploading of backup to cloud storages. – No backup integrity check. Exiland Backup is a lightweight, yet powerful and feature packed backup tool, that works well and offers a lot of features. 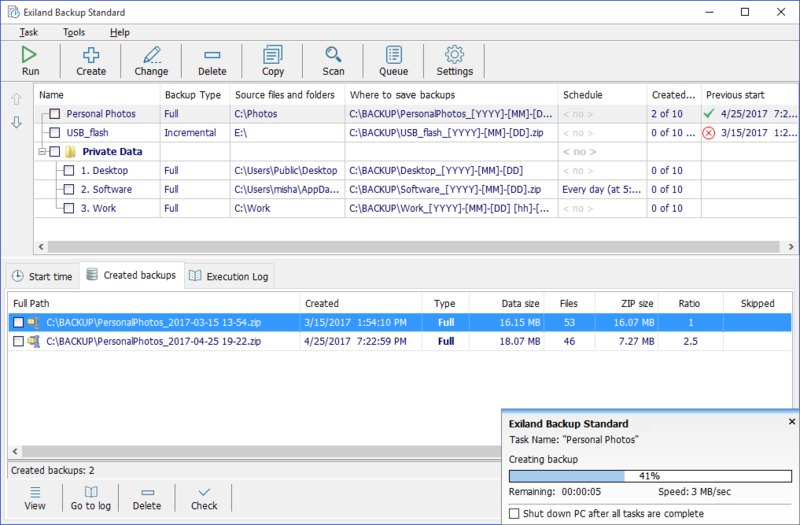 The backup tasks run smoothly, and the system resource usage is low to moderate during the run. The application does not crash or lag. It is definitely worth-trying.